As I already stated, when I discovered Greg Wosik – huge doors to the incredible opus of professionally-made anamorphic chalk drawings opened for me. This year in Lienz (Austria) there was a big street-art festival, and Gregor played a major role in it. As you can see, this time we have some amphibian animals and a giant grasshopper coming out of the crack in the floor, heading towards nearby pond. Since my German language knowledge isn’t that bad, I managed to understand how Marion Ruthardt (another talented artist) helped Gregor with this three-dimensional pavement image. I have also found out that the painting was done in the center of the city. Does it somehow remind you of this painting? Next An Audi R8 for $470 ??? I still don’t like the gallery format. I skip these illusions. oh and a great illusion! Im sorry but am i the only one who is getting tired of the street art? they are barely illusions. Don’t get me wrong, they are great works of art, but can’t we find something new??? These sidewalk illusions are starting to get quite boring. We’ve had so many of these already. It’s a bit same. 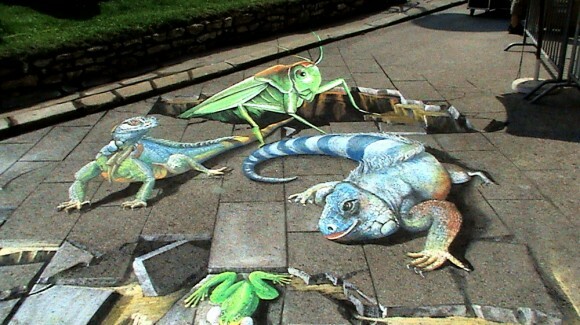 I love these types of chalk drawings. They are so interesting and cool to look at too! All this from caulk? Pretty impressive. I have the same opinoin as the first guy.